Thanks to its small size and flexibility, the ICL implant can be folded and injected painlessly into the eye in just seconds through a small incision in the cornea. Once injected, it unfolds and effortlessly positioned between the iris and the lens. The lens is fully accepted by the body. The Toric ICL operates as a conventional contact lens, except that it is invisible. Only the optical correction that brings you reports his presence, because otherwise you can neither see nor feel it. This lens is designed to remain indefinitely within the eye. However, it can be removed if necessary because it does not alter anything e structures of the eye or cornea. If you need a large vision correction, the Toric ICL is the obvious choice. It is also the ideal solution in case of thin corneas, dry eyes or large pupils. 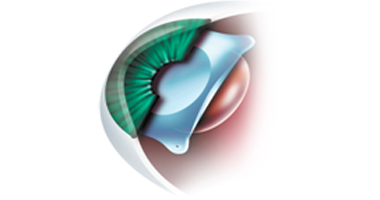 The Toric ICL corrects myopia and astigmatism in one intervention. Each lens is tailored to meet the specific needs of each patient. Besides excellence for quality it provides, the Toric ICL is a very accurate and reliable treatment offering exceptional degree of patient satisfaction. • A small opening is first performed at the place where the white of the eye meets the cornea. • A gelatinous substance is then injected into the eye and the Toric ICL is inserted carefully placed behind the iris and the gel removed from the eye. There it’s finished! The opening will heal itself very quickly. The implementation of Toric ICL is considered mild action come without hospitalization and takes about 15 minutes. After you can leave the clinic and return to activity two days later. AM I ABLE TO RECEIVE ICL?